The nonprofit Government Finance Officers Association awarded the Forest Preserve District its Certificate of Achievement for Excellence in Financial Reporting for the 29th consecutive year. The association developed the program to encourage agencies and professionals who are members to “prepare comprehensive annual financial reports that evidence the spirit of transparency and full disclosure.” The 2016 award recognized the District’s comprehensive annual financial report for fiscal year 2014 – 2015. The District manages funds from property taxes to not only aid in the conservation of land and natural resources but also the creation of nature-related programs for DuPage County's residents and forest preserve patrons. In 2015, the District took advantage of low interest rates to complete refinancing of some of its financial debt. The result is a $6.5 million savings over 10 years, which will be passed on to DuPage taxpayers in the form of lower taxes over the next several years. During the refinancing process, Standard and Poor's reaffirmed the District's AAA financial rating, which is a point of pride for our agency. 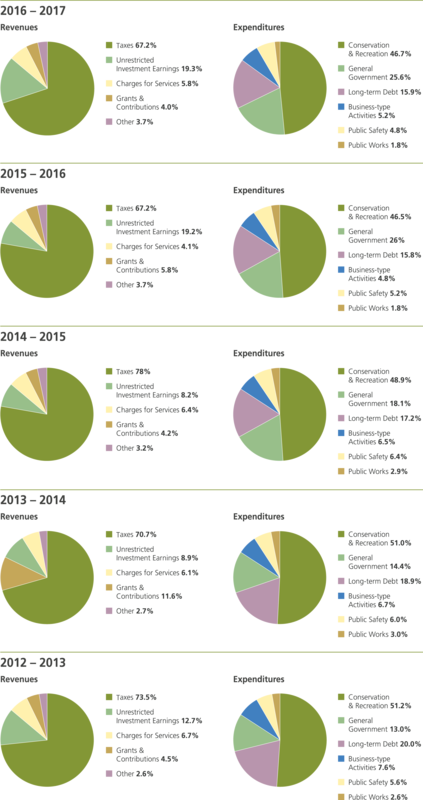 Funding for Forest Preserve District of DuPage County operations comes primarily from real estate taxes. 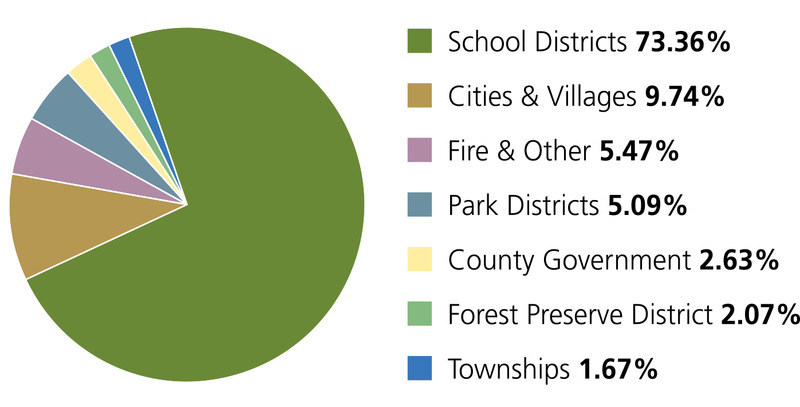 While nearly three-quarters of a DuPage County homeowner's tax bill goes to support schools, just 2 cents of every dollar paid funds all of the services the Forest Preserve District provides. During the 2015 tax year the homeowner of a house with a market value of $300,000 paid $169 to the District in property taxes. The District also charges residents certain fees and permits for use of facilities and services. Those charges make up about 6 percent of the District’s overall revenues. To report on its financial position and the results of its operations the District uses fund accounting, which demonstrates legal compliance and aids financial management by segregating transactions related to certain functions and activities. Funds are either governmental or proprietary. Governmental funds account for most of the District’s general activities, such as land acquisition, capital development, servicing of general bonded debt and general operations. Proprietary funds account for business-type activities and receive a significant portion of their funding from user fees. During fiscal year 2015 – 2016, the combined revenues of the District's governmental and proprietary funds totaled $81,538,796. The combined expenses of governmental and proprietary funds totaled $61,443,415. The most recent voter-approved referendum passed in 2006, authorizing the sale of $68 million in bonds to acquire land, restore native habitats, and maintain and develop trails and other recreational facilities. Because federal tax regulations require that 85 percent of the funds from the sale of bonds be used within three years from the time of sale, the Board of Commissioners completed two bond sales. A sale in the amount of $34,770,000 was completed in January 2007, and a sale in the amount of $33,130,000 was completed in November 2008. This plan will allow the District to meet obligations while achieving a manageable balance among high-priority land acquisitions, habitat-improvement projects and the development of trails and recreational amenities. So far, funds from the 2006 referendum have contributed to the purchases of 360 acres at 14 locations. In March 2012 Standard & Poor’s gave the District a AAA-bond rating on a new debt refunding issuance and reaffirmed the District’s AAA rating on existing bonded debt. This was the third time the District was rated under Standard & Poor’s Financial Management Assessment, which is effectively a report card on the District’s financial-management personnel and practices. Under this assessment, the District has maintained its “strong” rating — the highest rating possible — which is defined by Standard & Poor’s as indicative of “practices that are strong, well embedded, and likely sustainable.” These high ratings were transferred into low interest rates as underwriters negotiated with investors on the bonds. The budget is the foundation of the District’s annual financial planning and is a tool that staff uses to manage daily operations. Each budget year begins on July 1 and concludes on June 30 the following year. All District offices submit budget requests, which serve as a starting point for the development of the comprehensive document. Taking comment into consideration, the Board of Commissioners reviews and revises the appropriation before its adoption. Though not a formal part of the appropriation ordinance, the board uses a five-year projection of revenues and capital expenditures in its financial planning. The Forest Preserve District is required to publish a complete set of financial statements presented in conformance with generally accepted accounting principles and audited in accordance with generally accepted auditing standards by a firm of licensed certified public accountants.